Can you justify anyone’s decision to buy this shirt?! You bet I can justify anyone’s decision to buy this shirt!! This shirt is pure class! Pixelated images on a telephone or computer display screen do not adequately capture the quality of the buttons or fabric used to manufacture this shirt. This shirt is made out of 100% Kona cotton fabric. Kona cotton is a patented and trade- marked type of cotton fabric notable for its dense weave and high thread count. Kona cotton is still primarily sold to the quilting market, however; the uses for Kona cotton are becoming more diverse. The select cotton fibers used to make Kona cotton along with the high thread count and tight weave make this type of fabric stronger and more durable than other cottons of the same weight. Kona cotton is also made with the least toxic and most non-allergenic dyes available. Kona cotton is suitable for the bedding material for babies. There is a definite problem with low cost clothing sold at big box retailers leaching toxins such as lead and cadmium into the skin of people wearing these garments. Fabrics stained with low quality dyes are a definite health and environmental problem. Garments made with toxic dyes eventually plug up landfills and leach toxins into ground water thus eventually poisoning the entire local ecosystem. 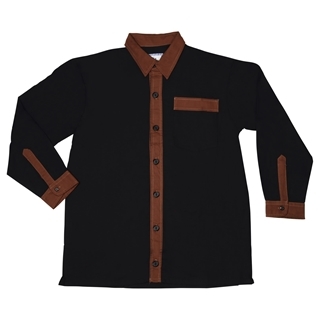 Kona cotton garments are great for people with allergies or notably sensitive skin. The buttons used for this shirt are different than the buttons used for the other color variations of the All Occasions men’s dress shirts. The buttons on this shirt are sourced from Germany and are primarily sold to the craft sewing market. The wholesale cost of the Kona cotton used to make this shirt is about on par with the cost of a cheap button up men’s shirt commonly sold at discount retail giants. A better shirt costs a bit more to manufacture, there is no way around this fact of life. Besides being stylish and cool this shirt is sewn together in the USA and helps to provide jobs for Americans and support American Industry. Yes, America could still be classified by economists as a wealthy nation; however, there are still plenty of Americans these days struggling financially who would value your support. Style Points: Stylistically these shirts give off a more subdued and mature vibe. This shirt is great for those wishing to highlight their inner centeredness and valuable experience. This shirt is a good one for those in academia or law, but still a good pick for the rest of us. This shirt says that you are a cool character on outings of every stripe. I named this shirt Downtown Brown after a police detective from the old 1980’s television show Simon & Simon. One of the characters in this TV show was a plain closed police detective named Lieutenant “Downtown Brown” from the San Diego Police Department.